Speech-language pathologists specialize in evaluating and treating children who have difficulty communicating effectively for a variety of reasons including difficulty understanding others, expressing thoughts and ideas, and pronouncing sounds. Speech involves the production of sounds needed for communication. Language involves using/understanding words or gestures for communication. This may involve both expressive and receptive language skills and may impact an individual’s ability to read and write. If you are concerned about your child’s communication development please contact us for an evaluation. An evaluation session is comprised of testing designed for all ages; for a younger child the SLP may use play-based assessment measures, while for an older child assessment may give insight to the child’s overall academic language skills. The test(s) administered will reveal how your child performed in comparison to a normed population of children their age. The SLP takes parental concern, the results, and observations on your child’s communicative strengths and weaknesses for their age into consideration when determining if therapy is recommended. If speech-language services may be of benefit to your child’s communication, the SLP will develop an individualized set of goals specific to your child. 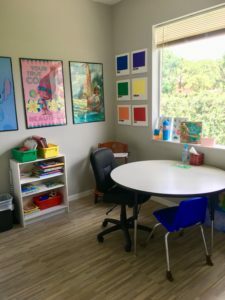 As therapy sessions take place, the SLP will invite parents/caregivers to get involved, collaborate in the process, and offer creative suggestions to support communication at home. © 2014 Kinder Therapie Lösungen, Inc.